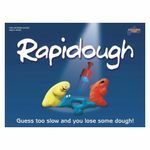 Rapidough is the original game of modelling charades. There's never a dull moment as everyone plays at once - every round! Players take turns at modelling the card entries for their team mates. The first team to guess what THEIR sculptor is creating wins that round. But there's a sting in the tail - the losing team loses a plunger of dough. If the opposition loses a few rounds they can find themselves attempting to sculpt, 'The Eiffel Tower' with a pea sized piece of dough..........the results are hilarious. GO!... is it a...giraffe? is it a...pyramid? is it a...rocket? it's The Eiffel Tower!